The name Michael (Mi - cha - el) translates to "Quis ut Deus?" (in Latin), which means "Who is Like unto God?" Beneath, are beautiful and powerful Catholic prayers to Saint Michael the Archangel. Glorious Saint Michael, Prince of the heavenly hosts, who standest always ready to give assistance to the people of God; who didst fight with the dragon, the old serpent, and didst cast him out of Heaven, and now valiantly defendest the Church of God, that the gates of hell may never prevail against her: I earnestly entreat thee to assist me also, in the painful and dangerous conflict which I have to sustain against the same formidable foe. Be with me, O mighty Prince! that I may courageously fight and wholly vanquish that proud spirit, whom thou hast, by the Divine power, so gloriously overthrown, and whom our powerful King, Jesus Christ, has, in our nature, so completely overcome; to the end that, having triumphed over the enemy of my salvation, I may, with thee and the holy Angels, praise the clemency of God, who, having refused mercy to the rebellious angels after their fall, has granted repentance and forgiveness to fallen man. Amen. O God, who didst render blessed Michael, Thy Archangel, victorious over the proud Lucifer and all the wicked spirits, we beseech Thee that, combating under the Cross, and ever adopting his maxim, "Who is like unto God," we may be victorious over all our enemies, and delivered from all impediments. Do Thou regulate our lives according to Thy will and commandments. Through Jesus Christ, our Lord. Amen. Glorious Archangel Saint Michael, do thou by thy protection enable my soul, enriched by grace, to become worthy of being presented by thy hand to Jesus Christ, my Judge, at the hour of my death. O holy Archangel, the devil has many weapons to employ against me at the last hour. These weapons are my sins by which he will then endeavor to throw me into despair. He is also preparing furious assaults of temptations, to cause me then to fall into sin. Thou, who didst conquer him, and didst expel him from Heaven, conquer him again, and drive him far away from me at the hour of my death. I beseech thee to grant this prayer for the love of that God who so much loves thee and whom thou lovest so much. O Mary, Queen of Heaven, procure for me the assistance of Saint Michael at the hour of my death. Amen. O Mary Immaculate, great Queen of Heaven and Earth and our gentle advocate, deign, we beseech thee, to intercede for us. Pray God to send Saint Michael and the holy Angels to ward off all the obstacles contrary to the reign of the Sacred Heart in our souls, our families, our country and in the whole world. And thou, O holy Michael, Prince of the Heavenly Hosts, from our hearts we beg thee to come to our aid. Defend us against the rage of Satan; and through the Divine power bestowed upon thee by God, after securing victory for the Church here below, guide our souls to our eternal home. Amen. Saint Michael, first champion of the Kingship of Christ, pray for us! A novena may be made at any time of the year, with any form of approved prayers. Many of the prayers given here may be used for this purpose, adding at the end: Obtain for us aid in all our necessities, particularly (mention favor desired). Glorious Prince of the Heavenly Hosts and Victor over rebellious spirits, be mindful of me who am so weak and sinful and yet so prone to pride and ambition. Lend me, I pray, thy powerful aid in every temptation and difficulty, and above all do not forsake me in my last struggle with the powers of evil. Amen. 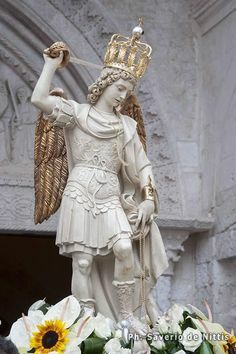 Great Prince of Heaven, Saint Michael, I commend my body and soul to thy protection, from this day henceforth I choose thee for my daily protector and intercessor, and I beseech thee graciously to assist me now and at all times, but especially at the end of my life. Keep me from timidity and obtain for me from God the remission of my sins and complete resignation to His Divine Will, so that my soul, consoled and cheerful, may leave my body; receive her then according to thy office, and lead her through the ranks of thy holy comrades to the face of God, in the enjoyment of whose presence she will be eternally blessed. Amen. [Source: Feast of St. Michael Archangel, from Goffine's Ecclesiastical Year, by Fr. Leonard Goffine, Imprimatur 1918]. Holy, Holy, Holy, Lord God of Hosts, the heavens and the earth are full of Thy glory. Holy Archangel Michael, defend us in the battle, that we may not perish in the dreadful judgment. O glorious Saint Michael, guardian and defender of the Church of Jesus Christ, come to the assistance of this Church, against which the powers of hell are unchained, guard with especial care her august Head, and obtain for him and for us that the hour of triumph may speedily arrive. O glorious Archangel Saint Michael, watch over us during life, defend us against the assaults of the demon, assist us especially at the hour of death; obtain for us a favorable judgment, and the happiness of beholding God face to face for endless ages. Amen. Glory be to the Father, and to the Son, and to the Holy Ghost, as it was in the beginning, is now, and ever shall be, world without end, amen. Before each salutation recite one Our Father and three Hail Mary's in honor of the corresponding Choir of Angels. First Salutation. At the intercession of Saint Michael and the heavenly choir of Seraphim, may it please God to make us worthy to receive into our hearts the fire of His perfect charity. Amen. Second Salutation. At the intercession of Saint Michael and the heavenly choir of the Cherubim, may God grant us grace to abandon the ways of sin and follow the path of Christian perfection. Amen. Third Salutation. At the intercession of Saint Michael and the heavenly choir of the Thrones, may it please God to infuse into our hearts a true and earnest spirit of humility. Amen. Fourth Salutation. At the intercession of Saint Michael and the heavenly choir of the Dominations, may it please God to grant us grace to have dominion over our senses, and to correct our depraved passions. Amen. Fifth Salutation. At the intercession of Saint Michael and the choir of the Powers, may God vouchsafe to keep our souls from the wiles and temptations of the devil. Amen. Sixth Salutation. At the intercession of Saint Michael and the choir of the admirable celestial Virtues, may Our Lord keep us from falling into temptations and deliver us from evil. Amen. Seventh Salutation. At the intercession of Saint Michael and the choir of the Principalities, may it please God to fill our souls with the spirit of true and hearty obedience. Amen. Eighth Salutation. At the intercession of Saint Michael and the choir of Archangels, may it please God to grant us the gift of perseverance in the faith and in all good works, that we may thereby be enabled to attain unto the glory of Paradise. Amen. Ninth Salutation. At the intercession of Saint Michael and the choir of holy Angels, may God vouchsafe to grant that they may protect us during life, and after death may lead us into the everlasting glory of Heaven. Amen. Then say the Our Father four times in conclusion: the first in honor of Saint Michael, the second in honor of Saint Gabriel, the third in honor of Saint Raphael, the fourth in honor of your Guardian Angel. Saint Michael, glorious Prince, chief and champion of the heavenly host, guardian of the souls of men, conqueror of the rebel angels, steward of the palace of God under Jesus Christ, our worthy leader, endowed with superhuman excellence and virtue: vouchsafe to free us from every ill, who with full confidence have recourse to thee; and by thy incomparable protection enable us to make progress every day in the faithful service of our God. Amen. Let us pray: Almighty and eternal God, who in Thine own marvelous goodness and pity, didst, for the common salvation of men, choose the glorious Archangel Michael to be the Prince of Thy Church: make us worthy, we pray Thee, to be delivered by his beneficent protection from all our enemies, that, at the hour of our death, none of them may approach to harm us; rather do Thou vouchsafe unto us that, by the same Archangel Michael, we may be introduced into the presence of Thy most high and Divine majesty. Through the merits of the same Jesus Christ our Lord. Amen. Indulgence of 7 years and 7 quarantines. 100 days, daily, for carrying this chaplet on one's person or kissing the medal with the representation of the holy Angels appended to it. Plenary, once a month, under the conditions of confession, Communion, and prayer for the intention of the Pope. The Feast of the Apparition of Saint Michael, May 8; The Dedication of Saint Michael, September 29; Saint Gabriel the Archangel, March 18; Saint Raphael the Archangel, October 24; Holy Angel Guardians, October 2. Holy Mary, Queen of the Angels, pray for us. V. Pray for us, O glorious Saint Michael, Prince of the Church of Jesus Christ. Let us Pray: Sanctify us, we beseech Thee, O Lord Jesus, with Thy holy blessing, and grant us, by the intercession of Saint Michael, that wisdom which teaches us to lay up treasures in Heaven by exchanging the goods of this world for those of eternity, Thou who livest and reignest, world without end. Amen. 300 days indulgence, once a day. Pope Leo XIII, September 23, 1888. O GLORIOUS Archangel St Michael, Prince of the heavenly host, be our defense in the terrible warfare which we carry on against principalities and Powers, against the rulers of this world of darkness, spirits of evil. Come to the aid of man, whom GOD created immortal, made in his own image and likeness, and redeemed at a great price from the tyranny of the devil. Fight this day the battle of the LORD, together with the holy angels, as already thou hast fought the leader of the proud angels, Lucifer, and his apostate host, who were powerless to resist thee, nor was there place for them any longer in Heaven. That cruel, that ancient serpent, who is called the devil or Satan, who seduces the whole world, was cast into the abyss with his angels. Behold, this primeval enemy and slayer of men has taken courage. Transformed into an angel of light, he wanders about with all the multitude of wicked spirits, invading the earth in order to blot out the name of God and of his CHRIST, to seize upon, slay and cast into eternal perdition souls destined for the crown of eternal glory. This wicked dragon pours out, as a most impure flood, the venom of his malice on men of depraved mind and corrupt heart, the spirit of lying, of impiety, of blasphemy, and the pestilent breath of impurity, and of every vice and iniquity. Arise then, O invincible Prince, bring help against the attacks of the lost spirits to the people of GOD, and give them the victory. They venerate thee as their protector and patron; in thee Holy Church glories as her defence against the malicious power of hell; to thee has GOD entrusted the souls of men to be established in heavenly beatitude. Oh, pray to the GOD of peace that He may put Satan under our feet, so far conquered that he may no longer be able to hold men in captivity and harm the Church. Offer our prayers in the sight of the Most High, so that they may quickly conciliate the mercies of the LORD; and beating down the dragon, the ancient serpent, who is the devil and Satan, do thou again make him captive in the abyss, that he may no longer seduce the nations. Amen. V. Behold the Cross of the LORD ; be scattered ye hostile powers. R. The Lion of the tribe of Juda has conquered, the root of David. O GOD, the FATHER of our LORD JESUS CHRIST, we call upon Thy Holy Name, and as suppliants we implore thy clemency, that by the intercession of Mary, ever Virgin Immaculate and our Mother, and of the glorious Archangel St. Michael, thou wouldst deign to help us against Satan and all other unclean spirits, who wander about the world for the injury of the human race and the ruin of souls. Amen. [Source: The Raccolta of 1910]. Before the Lamb's pure throne of light.